Binge worthy? This question is often posed in our increasingly couch-centric retreats, but what about in the live-performance universe? Can we binge there? Cerise Lim Jacobs’s brainchild “Ouroboros Trilogy,” comprising Scott Wheeler’s Naga, Madame White Snake by Zhou Long, and Paola Prestini’s Gilgamesh makes a strong contender for the appellation. The trilogy premiere promised (including world premieres of both the Wheeler and the Prestini) grand opera scale, impactful music, dazzling costumes and stunningly inventive visual imagery. “The Ouroboros Trilogy,” with libretto by Jacobs, follows the cyclic life of Madame White Snake, a mythical being inspired by Asiatic folklore, as she slithers between the boundaries of mortals and immortals, life and death, love and hatred. Accompanied by Xiao Qing, a once man turned into a half human, half female green snake, Madame White Snake finds and destroys love as the universe begins and ends around her. The question of whether a trilogy by three different composers can really be a trilogy is not a new one to this journal. Cashman Kerr Prince posed the question in the August BMInt preview of the trilogy (also a fantastic resource for background on the project, which can be read HERE). The question has also come up in casual conversations with other composers in town. And my answer is…apparently yes! This trilogy works as a three-part package. A concept akin to the movie Four Rooms comes to mind, where four directors tackle four separate portions of a single film. Here, three composers take on the three similar versions of a story. A few ever-present objects (a circular anklet and a round alms bowl), along with the overarching direction and production design of Michael Counts make the triptych work as a cycle. Something of a large-scale twist on the cadaver exquis idea finds each composer contributing to the whole with limited awareness of the other sections. In fact, one wonders less whether the three operas work as a cycle than whether all three of the components can hold up individually. Jacobs’s original concept indeed came at once in three parts. However, Madame White Snake was composed first; it premiered in 2010, and subsequently earned the 2011 Pulitzer Prize for music. On Saturday, Naga and Gilgamesh were respectively premiered on either side of Madame White Snake. The remaining two runs of the three shows re-order this placement based on Jacobs’s vision of an interchangeable unit of three. 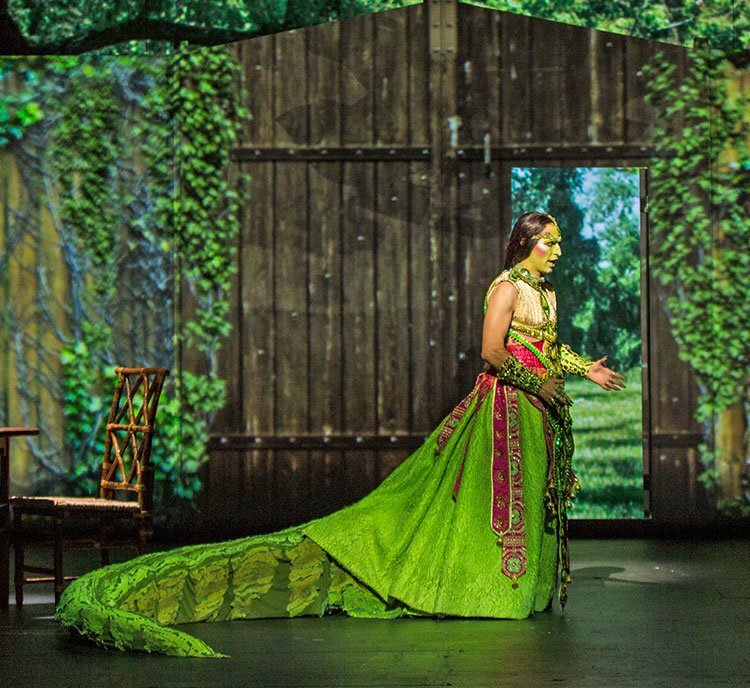 All three operas offer strong and entertaining musical journeys, but Madame White Snake remains the grand tour. The cast of each opera, with recurrent characters being handled by different singers (with one impressive exception), performed not just adeptly, but captivatingly. The visual display of the trilogy took advantage of modern digital technology to create awe inspiring sets worthy of the praise and growing interest the Beth Morrison Projects production group has garnered. In the spirit of mutli-teleological orderings, let’s start with the latter. This production’s use of digitally projected imagery and animation is astounding—or in Boston terms—wicked cool. Rather than merely having impressive scenery, the sets come to life as trees have leaves swaying in the breeze, the waters of oceans and rivers ripple in the distance, and a breathtaking moon slowly pulls back into the distance as a boat floats across the stage. In addition to its use in scenic devices, animation added to the characters on stage via a projected white snake. It is here that a virtual 5th wall, one between tangible stage props and digital imagery, is defined and smashed. In amazingly well-timed movements, images pass from lighted stage effects to living creatures, parts of the moving whole. Film is also used in Naga and Gilgamesh to give the audience a glimpse into the minds of the characters. It is also used to create a feeling of depth and size by projecting pre-filmed video of a singer, with the role being sung from offstage in a lineup that was so well rehearsed, it compelled me to ask the tech crew if any of it was live action video. These video elements are extremely effective and undeniably help entertain today’s audiences. They are no doubt part of how Beth Morrison productions are breathing a new young life into the theater. Whether you are a fan of opera or simply of stage production, or someone just wanting to try something new, these digital elements are absolutely worth seeing, as they will captivate and impress. There are a few issues. The well-timed voice-to-video synching just mentioned was remarkable in its timing, but the singer was so far off stage, it created a disconnect with the projected image. And if you are wondering if any animated elements might distract from the stage drama rather than adding to it, the answer is: yes, when an animated white anaconda is flying through the quasi-psychedelic cosmos. But these constitute minor details in an otherwise extremely effective production. The remaining question with the digital elements in these operas touches on the work as a triptych. As mentioned, filmed elements are only used in Naga and Gilgamesh, while the projection in Madame White Snake is solely for the use of scenery and the addition of the white snake in serpent form. The hitch with this is not an artistic problem, but simply that it helps to create a definition around Madame White Snake. All three operas make successful impressions, but Madame White Snake stands out as the Pulitzer winner it is, and creating any more defining elements around it only helps to highlight its distinction. Now to say Madame White Snake stands out is not to say the others aren’t good. In fact, it is quite the opposite, they are good—very good. But Madame White Snake is excellent, a near perfect score. From its first chord it grabs the listener and keeps him in its special world until its very last note. While all three are worth seeing, and do make a viable triptych, Madame White Snake stands as a definable centerpiece, which I believe will be true, even when not performed in the center. The strength of Naga comes from the seamless, varied textures Scott Wheeler weaves throughout. From welcoming, bright sonorities set to oddly dark texts in the children’s choir (seated house right), floating into stark, pointed rhythmic stretches punctuated with shocking Stravinsky-esque attacks, Wheeler admirably supports his well set vocal writing. A particular stand out moment was the beginning of Act II, where pizzicato stings subtly pointed to the eastern influence within Wheeler’s Western voice. If any issues existed, it may be with the use of the electric guitar, which by its nature stood out from the others in the pit. A valiant attempt at creating an other worldly aura, particularly when sonically contrasted with the purely acoustic harp, the balance of the guitar was problematic at times, creating some moments of unfortunate cover of the singers. This is a good opera, but it’s a question as to whether it stands alone. Its story and music seems compelled to be coupled with the rest. As I knew the day was continuing, it was difficult not to hear its end awaiting more to come. Zhou Long’s Madame White Snake is impeccable. Without question, Long’s greatest success here is his ability to manipulate tension—both harmonically and rhythmically—to stimulate undeniable emotional pulls in the listener. When his chords are dissonant, they are voiced in a way that allows them to breathe while still feeling the palpable tension within. He creates clear motivic elements, such as the rhythmically metallic clamoring of doubt in love. His use of choir (seated house left) was impressive, taking advantage of a huge range to create impactful choral settings. Also of note in Long’s score is the use of eastern instruments: percussion, erhu and wooden flutes combing into the Western score. The beauty of this is his subtle combination of non-Western sounds into the modern whole. An example is the gliss, a common performance tool on erhu. Long offers this simple gestural element as connective tissue throughout the work, where we appreciate the gliss in the erhu, the voice, the orchestral strings, the trombones, the theremin. It is a simple but incredibly effective tool to unify the whole. Long’s score impresses in how it will speak to a wide array of opera goers. It is undeniably modern, yet also has the melodies and rich harmonic worlds that the lovers of Puccini will melt into. Elements of the east, such as a returning pentatonic motive accompanying the Green Snake are orchestrated adeptly with the clarinets, making us understand each of its returns. One element that further separates Long’s opera is his ability to weave-in lighthearted humor. He gives us brief moments of relief—times we can hear, not just see the coy interplay of two lovers. This is a special skill and speaks to Long’s mastery. The subject matter of Madame White Snake, more love than horror, perhaps offers Long more of an opportunity for humor than his counterparts, but still, he does it so well that his prowess is clear. It really should be heard. Gilgamesh, the work of composer Paola Prestini begins with a thunderous eruption of percussion-capped sound. Her writing for percussion remains a highlight throughout her score. It sparkles, both literally and figuratively, using glockenspiels and drums for powerful magic, and marimba in motivic development and the undercurrent drone of tense moments. Her melodies entice and speak of a modern, yet accessible flair. As Long employed at times, Prestini uses the voice for the sake of sounds rather than just pitches at special moments. Gilgamesh’s dramatic conclusion works well for the end spot it was presented in, but would likewise work as a backward foreshadow when placed otherwise in the cycle. It is a fine work, but perhaps due its subject matter, never really lets go of its intensity. We are not granted the brief masterful moments of relief offered by Long, yet it holds its intensity with valor through its end. All three operas were performed brilliantly, with no roles being an easy sing. Two characters, the white and green snakes, are found in each of the stories. The character of Madame White Snake is portrayed by a different soprano in each, and each offered captivating performances. Stacey Tappan wielded Scott Wheeler’s coloratura acrobatics with refined finesse in her Naga role. In Madame White Snake, Susannah Biller enchanted us with a purity of tone that captured the mesmerizing essence of white snake’s powers. Finally, Hila Plitmann’s white snake in Gilgamesh rose into the stratosphere of the human voice with such control that it was magic incarnate. The only disconnect in the portrayal of these roles was the costuming. Though her place in this opera is undeniably different, the change of hair and headdress kept the Madame White Snake of Gilgamesh separated from her counterparts in the others. Xiao Qing, Madame White Snake’s traveling companion, half man, half snake, was turned female so that he could accompany his love (white snake) through time and space. To capture this androgynous role, the part is cast for a man with a female range. Impressively, this role was portrayed by countertenor Anthony Roth Costanzo in two out of the three operas (Naga and Gilgamesh). Costanzo delivered spellbinding performances. Decked out in a bejeweled gown and trailing a tail longer than he was tall, Costanzo delivered his role with a direct and penetrating projection. However, during Gilgamesh we are given a glimpse of the character’s tender side and Costanzo tenderly rolled the edge off his tone, making us feel for this half-serpent being. When he was on the stage, he commanded it—semi-serpent androgyny at its finest. Male soprano Michael Maniaci portrayed the role of Xiao Qing in Madame White Snake. The distinction here is that Maniaci does not produce the falsetto of a counter tenor, but because of a unique development (or non-development) of his larynx, he sings naturally in the soprano range. Maniaci’s voice is beautiful and his diction exquisite. The only consideration one must make is in taking all three operas as a binge-worthy whole. With no questioning of Maniaci’s performance, when bookended by the falsetto of the counter-tenor, the quality of Maniaci’s natural soprano seems to speak more to the female nature of the role rather than to its gender-limbo. Abbot Fahai, the force against white snake’s power, is found in Madame White Snake and Gilgamesh, with an “Old Master” counterpart in Naga. These paralleled roles were performed by basses David Salsbery Fry (Naga), Dong-Jian Gong (Madame White Snake) and Andrew Nolen (Gilgamesh). All three men delivered their roles with mystery and power, while Gong’s impressive bass-baritone range wowed in Long’s extensive Madame White Snake setting. 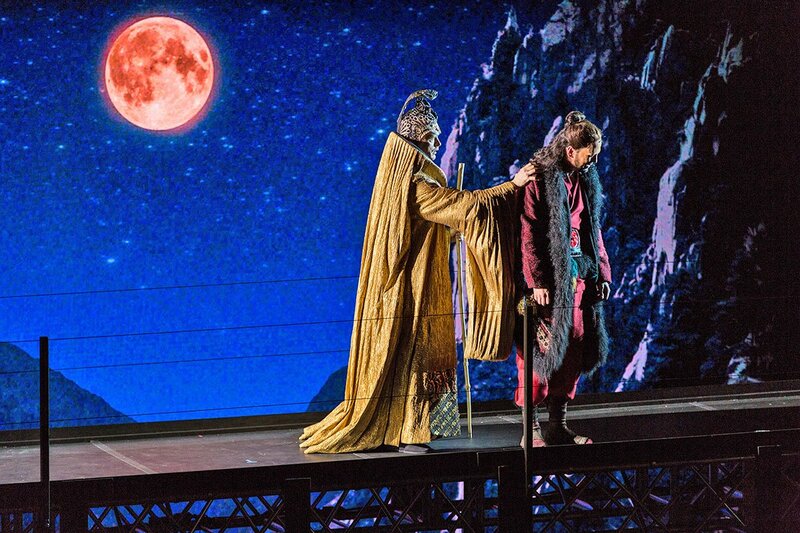 Paralleled characters of a monk (Naga), Xu Xian (the husband to Madame White Snake), and Ming (the white snake’s son in Gilgamesh) respectively featured tenors Matthew Worth, Peter Tantsits and Christopher Burchett. It was announced before the start of Naga that Worth was feeling under the weather, but was going to try to make it through the show. Had his sickness not been mentioned, it would not have been noticed, as he delivered a solid performance. Tantsits’s high soaring tenor combined lovingly with Biller during Madame White Snake’s beautiful duet writing. In the last of the triptych, Burchett’s emotionally honest performance of Ming and the personified Gilgamesh created unquestionable connections to his audience. Mezzo-soprano Sandra Piques Eddy (the Monk’s wife in Naga) and soprano Heather Buck (Ku, Ming’s wife in Gilgamesh) both conveyed Jacobs’s message depicting both the joy and pain of motherhood. Eddy, in the midst of a swirling psychological quasi-dream sequence, offered a tender and heart-wrenching moment in her rich tone. Buck later made us feel the joy of her character that waited so long to be with child—the love for the unborn was in each note—into singing through her labor and the subsequent taking of her child. She pulled us into the role. The two choruses—adult and children—performed wonderfully and powerfully. These groups hold special roles throughout the cycle, Jacobs discussing in her notes that they are the voices of the drowned children and the parents thereof. The Boston Children’s Chorus did a splendid job, as did the several soloists who deserve citation in the program. The day began and ended with the solo voice of a child. On what mayor Marty Walsh proclaimed as “Ouroboros Day,” each segment of the three-part performance hummed with excitement. Will-call lines stretched down the sidewalk, with Beth Morrison greeting people at the door. Each opera played to a nearly full house. As they strolled the streets of Chinatown and paths of the Commons and Gardens between shows, people could be overheard talking about what they just saw, and its multi-national folktales as basis. Simply said, a true opera event happened right here in Boston. The music should be heard, the production should be seen, and there is wisdom in the text. I’m looking forward to seeing these. One question I had was how Lim Jacobs (or the composers, if it was their ideas) explained the names of Naga and Gilgamesh, since the Madam White Snake story has nothing whatever to do with those Indian and Akkadian myths and stories, respectively. I get it that Naga has to do with snakes, but otherwise there’s nothing to connect them to this story specifically; and Gilgamesh? It all seems rather arbitrary. Or am I missing a cultural thing about non-sequiturs, so that you can write The Snow Queen and call it Gunfight at the OK Corral? I probably won’t be going to MWS and Gilgamesh, but I did see Naga last night, and I thought it was a smashing success. I won’t argue with Justin Casinghino about its theatrical contingency with respect to the other operas in the trilogy (it does end, after all, with the equivalent of “to be continued”), but as a musical experience it was, I think, not only superb but Wheeler’s best work to date. It was full of surprises that always seemed perfectly inevitable; and I was not at all put off by the electric guitar, I thought its sonority a lovely complement to the orchestra. I second all of Casinghino’s observations about the performances; Anthony Roth Costanzo knocked my socks off (and I marvel at how he could maneuver that tail around–wonder how it was built and attached to him!). The lighting design for the projections and scenery was also a marvel. As to the “story” line and why the operas had the names they have, I followed Lloyd Schwartz’s advice and reviewed the plot synopses, but frankly it all seemed a jumble to me at the time. Looking again today it makes somewhat better sense, but I’m still not fully persuaded by the cultural syncretism or the literary quality of the text. Well, that’s opera for you.